While walking on horseback, the Sagittarius parent prefers a canter, and Libra is excited by everything they see, they regret that they can not go to a slower pace. Despite the fact that Libra continues to smile, very little effort is required to dislodge them. Libra - a sign of balance, he needs a measured life in order to maintain calm. Sagittarius can get carried away, striving for more, and no one will allow to prevent his desire to race about life at a gallop. Of course, Libra would prefer the lynx as a golden mean (Libra always prefer something in between), then to slow down the pace or add speed, depending on the mood. But Libra is so skillfully fit into the plans of other people, and Sagittarius’s plans are usually so exciting that Libra agrees to them. But when they two go on a visit, Sagittarius mom can be proud of the fact that she has such a lively and charming child. Well, the child is delighted that his mother knows how to invent interesting games! This is really good for her, which can not be said about those moments when it comes to responsibility and discipline. This mother prefers the serious aspects of life to the game, and Libra needs a sense of a certain order, without which there is no peace of mind. Reasonable discipline will not let him get lazy or use as a weighty argument his charm and help develop those constructive and business qualities that he sometimes lacks. The mother must have in her arsenal some well-argued rules so that the child knows exactly what is required of him. Libra definitely need help when it comes to making responsible decisions. Just do not go through the least resistance and decide something for the child, because he must learn to do everything yourself. Both of them love traveling, but if Mom-Sagittarius likes to go somewhere and find out something, then her baby-Libra would prefer to lazily bask in the sun at this time. In general, he is not too enterprising and sometimes overly cautious, and it would be nice to teach him to take risks at least occasionally. Together they will receive a lot of pleasure from life. Kind by nature, energetic and cheerful mother will be able to find suitable lessons for her child. She can not only expand his horizons, but also give him a bit of his own everyday wisdom. It is good to have such a mother, is not it? This father loves sports and will be happy if his child will make him a company. But an endless discussion of something new and interesting will give both pleasure. The child is happy that he can support the dreams of his father, and he will build air locks to give pleasure to his baby. Sagittarius, as a creative person, will be able to discern the artistic or musical abilities in the child and will try to do everything to develop them. And he will see to it that Libra does not have time for laziness! If they quarrel, carefree Sagittarius is easier to reconcile. He quickly forgets everything, whereas Libra does not make it easy. But the father can quickly raise the mood of anyone, because he himself almost never faint, except for those rare cases when life makes him lose heart and he for some time loses its optimism. And when this happens, Sagittarius should explain to his child that this is not due to his fault, because Libra takes a lot at its own expense. And they do not want to upset anyone! The father should also be careful not to demand too much from the child. Well, if he leaves his advice without attention, it is also better not to show any special concern. 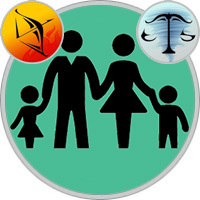 Libra should get used to independence, and it would be too easy to let my father think for himself! The love of adventure, which lives in the father, can carry away and his child. Sagittarius will also help him develop self-confidence. Add to this a common sense of optimism and joint enthusiasm - and you will understand why the Libra baby can grow up alongside such a father really kind, generous and caring person.